Santayana enjoins us to recognize the echoes of painful history and do what we can to prevent its recurrence. History is cyclical but we can never anticipate how recurrences will manifest. It’s never identical. It is our unfortunate nature to project evil onto others as if we are not capable of it ourselves. In considering the history of Nazi Germany we do so at our peril. The Third Reich rose to power in Germany during the Weimar democracy that followed World War I. Germany, the nation that brought us Bach, Beethoven, Brahms, Goethe, Bertold Brecht, Thomas Mann, Schiller and others, an enlightened society with free elections and the rule of law, also brought us Hitler and the Nazis. A plurality of Germans voted for Hitler’s party and he became Chancellor in 1933 through legal parliamentary processes. As Jochen Bittner noted in the New York Times (May 31, 2016) there were four conditions that cleared the path for the fall of the Weimar democracy and the rise of the Third Reich – economic depression, loss of trust in institutions, social humiliation and political blunder. I would suggest that these conditions exist again today. In a time of economic stress, Hitler and the Nazis pledged to “make Germany great again.” Ordinary citizens responded to the appeal of demagogues who used fear, populism, xenophobia, nationalism, bigotry and scapegoating, and the promise that an authoritarian ideology would save Germany from its decline. Hitler’s campaign was one of violence against individuals and groups, dependent on fear, and utilizing inaccurate historical analysis and outright lies to mobilize a vulnerable population. They demonized the press and developed a propaganda campaign of savage efficacy. They threatened the judiciary and the press. Few could envision the horrific outcome. BEFORE THE COURT OF HEAVEN, as historical fiction, animates and illuminates the history of Weimar and the rise of the Third Reich as a cautionary tale for our time as well. It is the story of how ordinary citizens, people no different than ourselves, became complicit in extraordinary crimes. 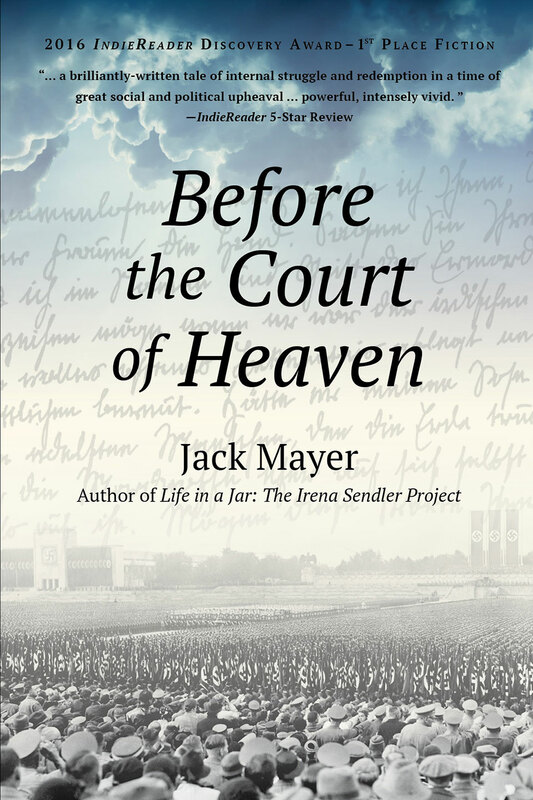 Scholars of history and the Holocaust from Middlebury College and the University of Vermont Center for Holocaust Studies have vetted the historical accuracy of BEFORE THE COURT OF HEAVEN. BEFORE THE COURT OF HEAVEN tells the stories, real and imagined, of individuals embedded in this history. As a writer I use the particular to focus a larger reality. History has the quality of fractals - similar patterns recurring at progressively smaller scales. We glimpse a larger whole through examination of quotidian details, the ordinary lives we can relate to, that are the sub-atomic particles of history. My hope is that by animating this history, readers will recognize the capacity inherent in each of us for unspeakable horror and remarkable goodness – our devils and our better angels. We, too, have choices to make.